In its Casual Chic universe, Bertolucci pioneers creations where the 4 “Cs” – the very essence of the brand – feature fully: Creativity, Curves, Comfort and Construction. The Italian Riviera, a source of ceaseless inspiration, and Switzerland, with its technical expertise, mingle and interweave to design new silhouettes playing with the softness of curves and the elegance of lines. Well-being is celebrated in designs which combine comfort and harmony, resulting in a daily luxury. Classic yet subtlety unique, the Casual Chic models combine simplicity and modernity to match any moment and mood of the day. GIRO typifies the brand’s Casual Chic style: elegance and simplicity for a daily luxury. The classical round shape is revisited adding a touch of originality … so Bertolucci! In stainless steel or 18 carat pink gold, the bezel draws a loop reminiscing of the bounce of the pebble on the surface of the water. Dedicated both for men and women, GIRO is offered in a large selection of movements, combination of finishing and dials to match any expectation. From its purest execution in 3 hands quartz watch, GIRO becomes jewellery with the sparkle of diamonds or the richness of rose gold touches, and adorns a very traditional or a true sporty look through its various dials and calibres. Simple with a subtle uniqueness, GIRO is a contemporary yet timeless collection, with a stylish look and sober elegance to be worn in any circumstance and match every moment and mood of the day. Following the introduction of the All black PVD models, GIRO claims to be more classical by adorning new white dials. Proposed on a traditional punched leather strap, the new executions play with polished and fine-brushed finishing on white silvered opalin dials with stylised indexes, to offer a pure, chic and classical style. 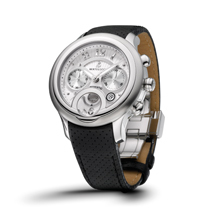 The two models adorn a skeleton case back with sapphire crystal revealing the movement. And, innovative detail on the automatic chronograph: the sub-counter hand at 6 o’clock is replaced by a turning disc to indicate hours of the time kept.